Do you modify your approach according to context? I look in the rearview mirror. Blue lights flashing. Maybe he’s been called out to respond to a call and will overtake me. No, he’s flashing me. Instinctly I’ve slowed down, I look at the speedo, it is in KM/H and I’ve not been paying attention to the roadsigns, but it is clear that I’ve been going too fast. So I pull over. The question in my mind is what to do next. I’m in Australia, driving an awesome road, the Great Ocean Road that just asks for a car to be driven (OK, it’s hardly an Grand Tourer, it is a compact Hyundai Getz). The brain is racing, pumped by adrenaline and fear. In the UK I would get out of the car, go to the back of it and talk to the officer. You’ll be asked to do this anyway “Would you kindly step out of the car sir”… The last time I hired a car overseas was in the US in Atlanta. Driving through the deep south I got pulled over and I jumped out of the car. Bad move. “You’re makin’ me kinda nervous’ the cop drawled with his thick southern accent. He spread me over the ‘hood’ to search me and ended up taking me down to the station, something that was straight out of the Dukes of Hazard, and handed me a huge fine to pay. So I’m slowing down and thinking do I do the UK thing and jump out, or do the US thing and stay in the car? I decide to stay in the car. The right move. So that’s an interesting story, but what does it have to do with the themes that I usually blog about? Adapting your approach based upon context. A while ago I met with the CIO of a company whose core business is in complex instrumentation hardware. They were looking to diversify their offering, take some of their products out of the hands of specialist practitioners and into the broader marketplace. Core to the success of these new offerings was usability; their devices required complex set-up and calibration. Their question; how do you redesign an expert system for novices? Seeking an answer they hired a customer experience consultancy to gather insights, understand the new segment needs and create wireframes for the new application interface. But the consultancy couldn’t fit with the way the company worked. They would run a workshop with the client for a couple of hours then go ‘back to base’ to do the thinking and designing and return to present their designs, well thought out and well polished. Yet every time they would come back they had got something wrong. That approach may have worked for a website, but for this complex product they were getting it wrong. We were asked for our advice. I started by saying that I thought they should stick with the incumbant, whilst we would love the business, both parties had invested a lot and learned a lot in the past few months and it would be a folly for us to come in and have to start from scratch. The answer was to get both sides into the same room, a war room, and thrash out the designs. Forget about their formal methodology and way of doing things. If you they were both in the same building they didn’t need that formal staccato present – review – sign-off process. They could continually innovate. That is certainly the way we would do it, yet the CIO thought the incumbent would be resistant to changing their ways. The theme that joins these two stories? It’s about reading the situation, knowing the culture and context you are in and adapting your approach and behaviour accordingly. And that applies as much to agile practitioners as Big Methodology people. know your audience, understand the context then pick your battles; think big, start small scale fast, remember that change won’t occur overnight. Day trip to Shenzhen from Hong Kong. Most nationalities can now get visas at the border (why do us Brits get screwed with such expensive visas? ), but be warned, you have to pay for them in RMB. Once you’ve cleared immigration Hong Kong side there is no ATM, so if you’ve got no Chinese money, you are at the mercy of the folk in no-mans land. There’s a counter by the visa office that will change money, but the rate is truly lousy. Me: “Hello, I’d like to book a flight back to London on Thursday please”. And that was it. No friendly warning, so close to doing this again. If I ask for a flight on Thursday, common sense suggests that the fact that the plane is scheduled to depart 35 minutes into Thursday, and I need to be at the airport at 10pm on Wednesday, then it really isn’t a Thursday flight. Not being explicit and clear with this is rude business. Marketing may be a touchy-feely occupation, but the language that marketeers use is far from it. Campaigns, strategy, tactics, targets… all out of the military handbook. That might be OK within the organisation, but it shouldn’t be exposed to your customers. 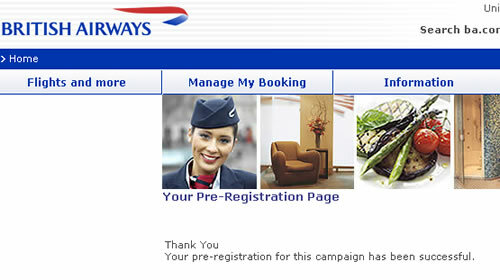 An email sent by BA inviting customers to register to a special deal results in a page informing the customer; “Thank You, [name] Your pre-registration for this campaign has been successful”. Now what is that all about? They’ve spent so much time creating the campaign, how it fits into their overall strategy that they’ve overlooked the details around what really matters – fullfillment, wording and how the customer feels about BA at the end of the process. I feel a little cooler than when I clicked on the promotion. Chinese immigration – how did I do today? Today is one of those days. A meeting in Zhuhai at 11am. Take the 08:40 ferry from Hong Kong, no problem. I’d researched the ferry times, got to the ferry port with loads of time to spare and went up to the ticket counter. “Ticket to Zhuhai please”. Suddenly there was an earlier 8am ferry leaving in five minutes, if I run I could catch it. “You’re sure this goes to Zhu…” I started to ask, but the man behind the counter cut me off. “Yes it goes to zhunzen, now hurry!” but I didn’t hear him correctly, I was focussed on a boat leaving earlier than expected, and that would definitely get me to my meeting on time. Communication Breakdown. It was only as the ferry left Hong Kong and turned right rather than left I realised my mistake. I was on the boat to Shenzen. But that is not the purpose of this post. Arriving in China, when going through passport control, under the glass window there is a little box with three buttons on it, inviting you to rate your experience – green for perfect, yellow for satisfactory and red for unsatisfactory. Capturing customer feedback at the time of the experience. Howe much more valuable is that than asking customers to complete a lengthy questionnaire some time later, after the event. I think that websites could learn from this. Rather than a pop-up inviting customers to complete a questionnaire of a number of pages (often this appears just as you start your experience at the site), why not get customers to “rate this page” or “rate your experience” as a simple thumbs up or down (as you might Digg comments). This will provide instant feedback, maybe not qualitative, but quick and simple quantative data. And if I had the ability to rate today? Right now, as I sit in a dingy cafe waiting the two hours for the next ferry back to Hong Kong, with a rapidly flattening laptop battery, I’d have to press the thumbs down, unsatisfactory red light on my current experience. After a month living out of a suitcase, circumnavigating the globe I’m homeward bound. I’m flying with Oasis… going to be interesting how the words “budget” and “longhaul” reconcile with each other. So far the experience is promising, a nice touch with their e-ticket (the date which I have subsequently changed). The plane flies at 00:50. BA fly back from Hong Kong a little earlier; on their e-ticket they don’t make it clear that the flight is a post-midnight one. Last time I did this trip I arrived at the airport on the Sunday night beleiving my flight was late on Sunday. Only it was a few minutes after midnight… on the Monday morning. I’d missed my flight by 24 hours. An easy, and expensive mistake to make. Oasis have gone out of their way to help me not make this mistake.